From the creator of the 1000 Dot-to-Dot series comes Querkles Animals, putting an exciting new twist on the classic colour-by-number images that we loved as children. At first, you see nothing but a baffling tangle of circles, but hidden within each puzzle is a furry face waiting to be revealed! 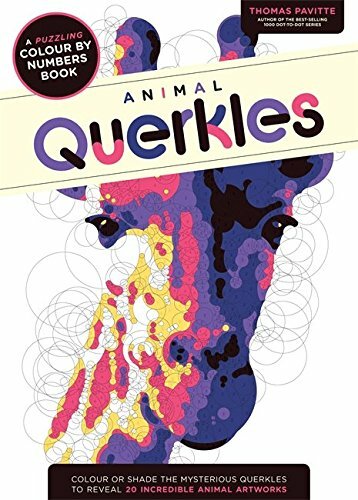 Featuring a menagerie of adorable creatures from chomping chimps to louche giraffes, Querkles Animals provides hours of creative colouring fun for artistic minds of all ages. Choose a dramatic colour scheme to make your Querkle truly unique, discover what's hidden in each puzzle, and create a striking animal portrait that you can easily remove and display. I had never heard of Querkles before but I love adult colouring books so when I was offered this for review on Amazon Vine I put in my request immediately. I have to admit I was a little sceptical about a colour-by-numbers book, sure I loved paint-by-numbers pictures as a child but I was worried it would be far too boring for an adult to colour in. Rest assured this is in no way boring and I'm absolutely loving this colouring book so far! This book contains 20 different images to colour, all printed on a single sheet of A3 paper that is thick enough to colour with sharpie pens without damaging the next picture in the book. The pages are also perforated to make it easy to tear out the designs you're finished with in case you want to frame and display them. Each image is made up of hundreds of interconnected circles of all different sizes and they're all designed to be coloured in using five different colours or five shades of a single colour. Because of the way the images are created it's actually very difficult to tell before starting what animal you're actually going to be creating but there is a page showing black & grey thumbnails of each finished design at the back if you want to take a sneaky peak. Personally I prefer to be surprised as I start colouring. So before you get started you'll need to choose 5 colours for your image. They can be shades of the same colour or contrasting colours but you need to line them up from dark to light, 1 being the darkest and 5 being the lightest. I'd personally recommend using pens to colour the image since the area you'll be colouring is on the large side and pen also has the best chance of hiding the numbers once you're complete. I'm not going to lie you can still see the numbers even through my sharpies but from a slight distance they're not really noticeable and they don't detract from the finished image. This collage shows how the picture gradually begins to take shape as you add each different colour. I absolutely loved watching the finished design come to life and I'm really pleased with the results. I think the hardest part of this colouring book is actually selecting the colours you want to use but it's also a lot of fun. I'd recommend having some scrap paper on hand to try out different combinations before you start colouring the actual book, especially if you're planning on using bold or unusual colour combinations, so that you can get a better idea of what works and what doesn't. Half the fun of this book is going to be experimenting though so don't be afraid to take risks or try something new. I've only completed 2 images from this book so far but I'll come back and update this review as I finish others over the next few months.